Changing nutrition needs in Baby Boomers & older adults. Helping aging adults find meaning in their life. Improving quality of life in the elderly through enhanced creative and social activity engagement. It is time to end high-tech, low talk medical care. We must use the forgotten tools of medical care: compassion, communication and hand-holding. We have few cures for chronic diseases. Piling on the pills is not always a panacea for the ails of elders. We should promote vitality during the aging years and help elders retain their personhood, dignity and independence. Encouraging patients to exercise daily even if they do so from the bed or wheelchair. Why the name “Endless Knot” Press? 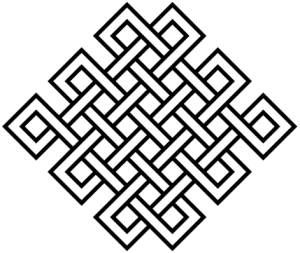 Simply, the endless knot is a Buddhist symbol for boundless wisdom and compassion — two words relevant to concerns of aging and caring for older adults. Another word that is crucial to aging: Adapting. Aging well requires adaptation to significant changes in life and functional losses. Who Should be Checking for Info on the Endlessknotpress.com Web Site? Organizations that represent the older adult population can enhance membership benefits by offering our future products. Baby Boomers who seek deeper understanding of and cutting edge info on aging well.